Love it! I collect elephants and this is a great addition. Give your room a unique and trendy look with this whimsical elephant print quilt set. This three piece set comes with one stylish quilt and matching shams to complete the look of your bedding ensemble. Crafted with polyester materials in your choice of blue or orange colors, this bedding set is sure to lend a pop of color to any sleeping space. This came excellently packaged, it was boxed perfectly the quilt set was inside of a zipper protector bag, that you can store your quilt set in when not displaying it, this is truly a magical piece the elephants are beautifully patterned in turquoise, lime green & navy, I have a new bedding set from Ashley that is a worn gray finish these colors really set my furniture off. The pictures below 1st one is the quilt side the second is the back side it is cloth and patterns are on both sides I love that. The quilt itself is also front and back with designs. You really can’t go wrong with this set it can be a adult bedding set or a child’s room it is classical & bohemian you have a lot of colors to work with these textiles. 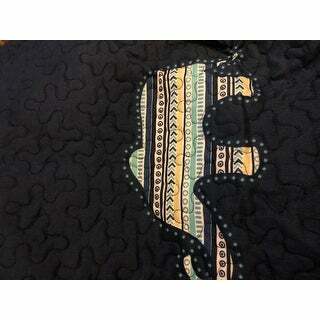 Love the elephant quilt that I purchased for my grandson. The color is great! I love my quilt set! Fits my king size bed with no shortage of width and length! Feels spectacular! Would love to purchase in another color if it becomes available. 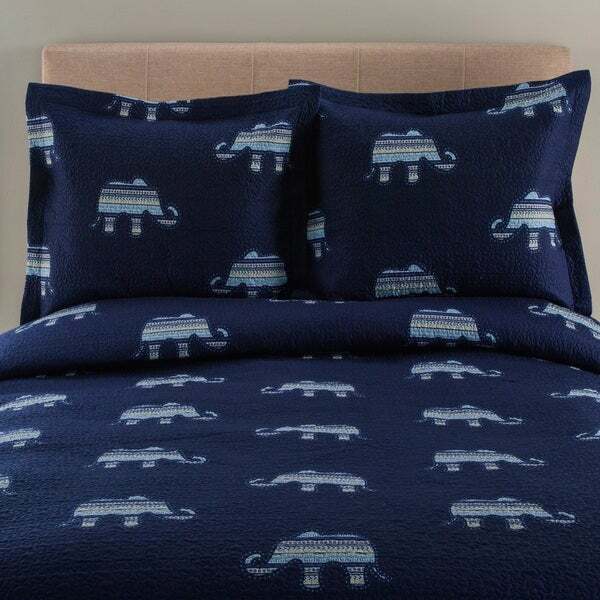 This Quilt set with the elephant motif is a fun addition to our bedroom. It’s light and attractive and easy to wash. The color and texture are of good quality too. This is a really cute quilt. 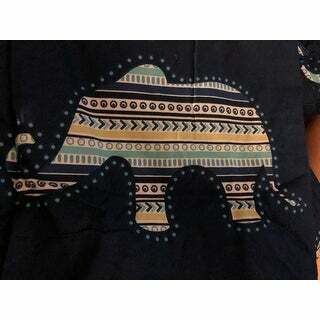 Just right for spring and fall weight on the bed when the nights aren't too chilly, Rich, dark royal navy blue color and clear designs with the elephant motif. Love it. Cutest little quilt ever. Tiny elephants all in a roll. Baby talk! Baby wall! Nursery crew come here and talk to me about this little navy blue quilt. Quilt as can be slip it into my nursery! Boys girls it fits them all. Buy One and have a ball, no two! Bought this for my elephant loving child, and he is thrilled! The print is adorable and quilt seems to be good quality. This quilt is best for summer/early fall weather. Need to layer for colder nights. This a wonderful quilt set it won't disappoint. Absolutely a good choice for grandsons ages 6 and 3. Same as other review for this order. Looks better when put on the bed and with the other pieces. This looks even better in person! I ordered this for my guest room and it is just as cute as it can be! Great quality and a lot better than anticipated. Colors are vibrate and it seems to be well made. Also arrived very quickly. "Is this going to be available in orange soon? " No. The orange quilt set has been discontinued.